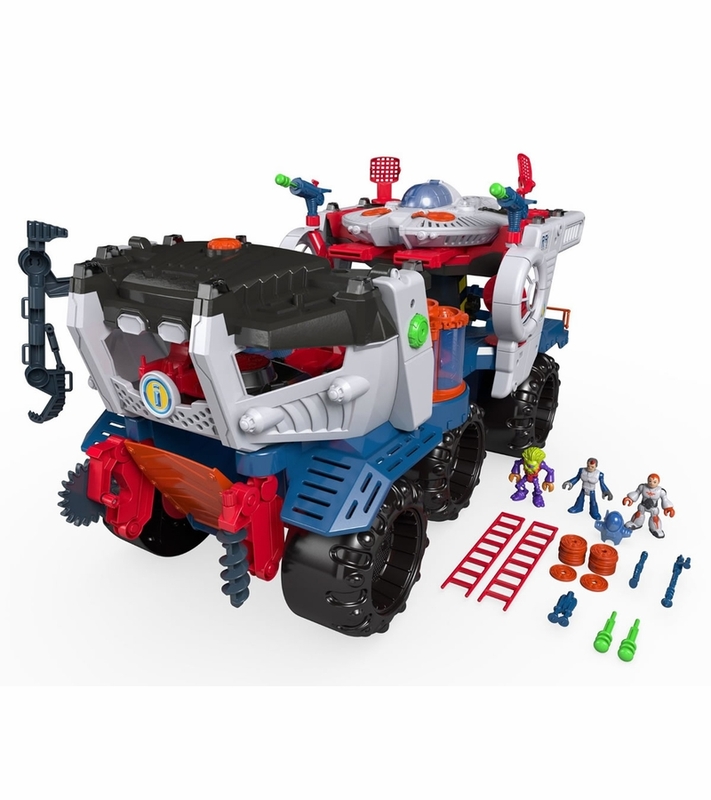 Here�s the ultimate Imaginext� outer space experience � the Battle Rover that�s a giant playset/vehicle and an amazing, removable space shuttle in one! 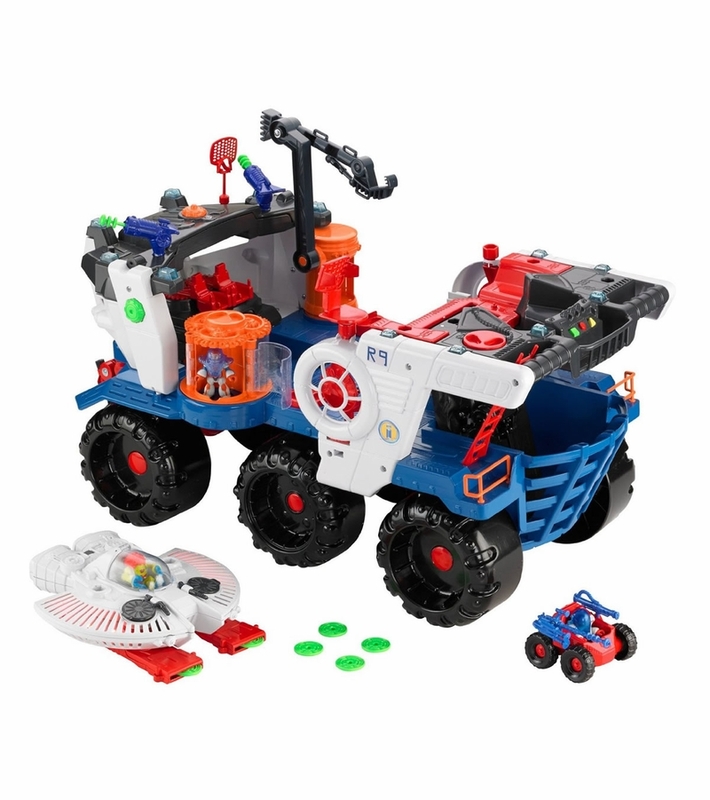 It has everything a young space explorer needs to create the most out-of-this-world adventures, including projectiles; disk launchers; an alien-detecting chamber that lights up; 19 lights and over 200 unique sound effects and phrases; a transforming and removable space shuttle with its own projectile launchers and sounds; a kid-activated control panel; pull-out drill, saw blade and crane; three figures and a small vehicle. 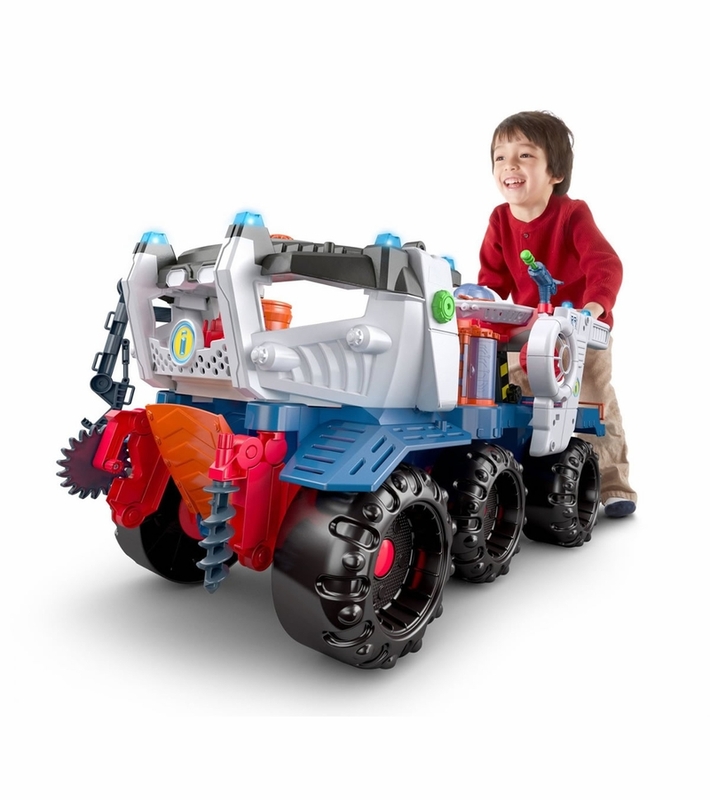 With so much to hear, see and do, this colossal vehicle will take kids� imaginations into another galaxy! 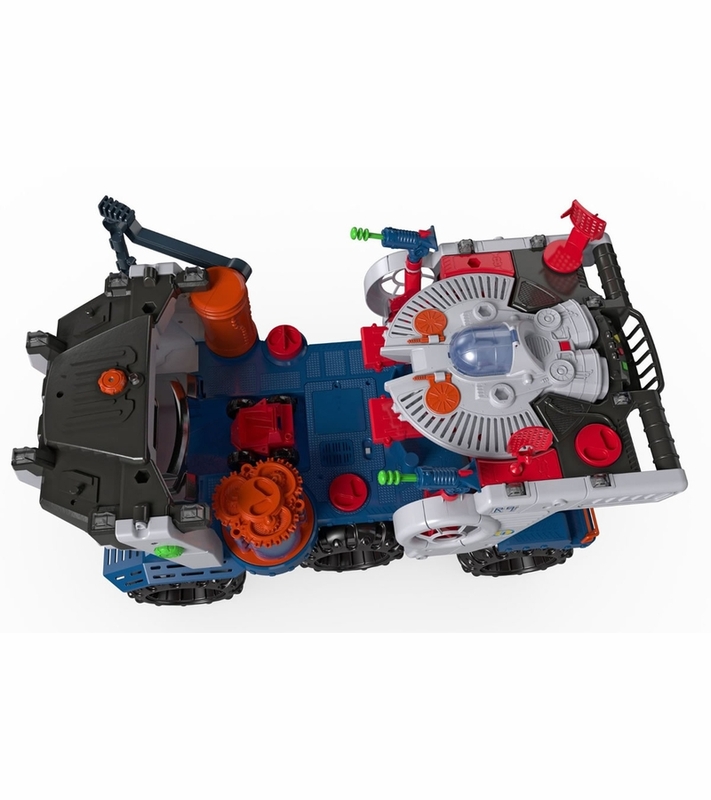 When other Imaginext� ships (sold separately) fire at it, the Rover responds with different SFX and phrases! I'm not sure how this toy doesn't score 5s in every review....none of our features have broken in the 3 years we've owned it. Although it was pricy, we got a great deal during the holiday. Be ready, it takes up serious space in the play room, but rarely is my son or his friends bored with it. Even better, it plays with with Super Friends in space (Green Lantern, Superman, Zod, etc.). I recommend this product totally, but look for deals. This Fisher Price toy is durable plastic like always, but the elevator has stopped working on day three. Our spaceship is still launching and the kids, age four, are still playing with the rover, but the best or second best part is broken. I have replaced the batteries in hopes that would fix the issue , but it seems to be the switch that the man stands on that activated elevator. I am very pleased with this purchase. We have a lot of I'maginext products and they are all good but this is the best. There are so many fun features and it holds his interest for a long time. It is so large he is able to sit inside it! His favorite gift this Christmas! I am very pleased with this purchase. We have a lot of Imaginext products and they are all good but this is the best. There are so many fun features and it holds his interest for a long time. It is so large he is able to sit inside it! His favorite gift this Christmas! This was the best Santa gift, until about 45 mins into playing with it, but only the second time he activated the lift, it closed down and would no longer work. My husband inspected it and noticed that if you turn the activation switch the wrong way it pull the wire loose from the trigger. It was able to be fixed with some knowledge but it will happen again and you won't be able to repair. That is a huge disappointment and as much as it costs is not worth it. 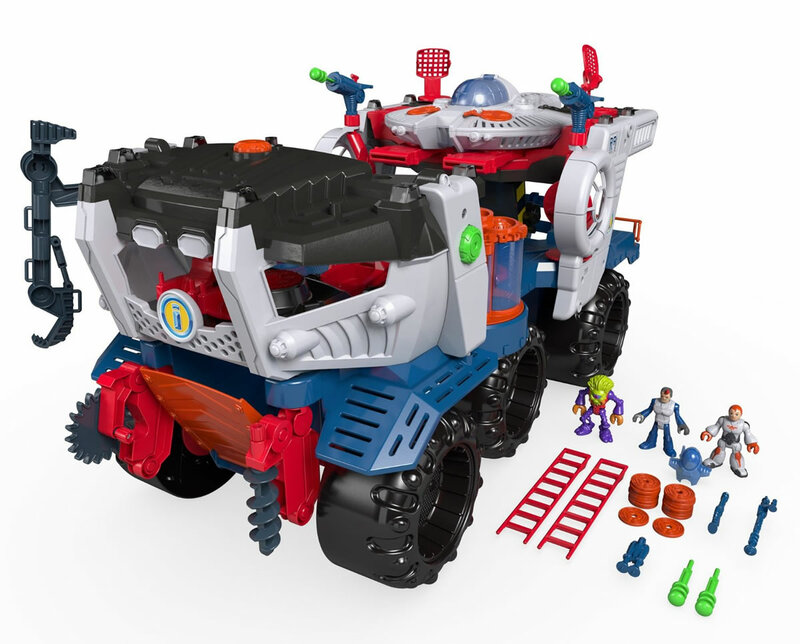 We typically love all imaginext toys but we keep them at a lower cost range in the future with fear of them failing so quickly. It's a great toy. My kids ride on it and he's able to put all his toys in it. Has all sorts of cool noises and lights. The only bad part is huge to store. This toy is amazing! It has so much stuff to do. The kids play with it daily and even ride on it. There are lights and stairs cages aliens astronauts flying coins a car a jail etc etc. This is a talking toy with lights, we were worried about battery replacement but it's been 5 months and it's still going strong. The durability is great no scratches cracks or missing parts. I am a toy nerd and I am always looking for the coolest toys and this toy is my personal number one favorite! My 7 year old son LOVES the rover. My 7 year old asked for this from Santa and got it. The interactive features are fantastic! There are a lot of different sayings and noises. The good (and bad) thing is that it's huge! We have always loved I'maginext products and they have held up VERY well. I love to see him playing "guys" again. I've recently put higher restraints on his computer time and so the "guys" came out! I LOVE to hear the adventures and battles he has. I even love playing with this thing! It's like a Barbie car on steroids!!! My 7 year old asked for this from Santa and got it. The interactive features are fantastic! There are a lot of different sayings and noises. The good (and bad) thing is that it's huge! We have always loved Imaginext products and they have held up VERY well. I love to see him playing "guys" again. I've recently put higher restraints on his computer time and so the "guys" came out! I LOVE to hear the adventures and battles he has. I even love playing with this thing! It's like a Barbie car on steroids!!! As a Christmas gift this year, my wife and I thought we were getting a fun, durable, tough, toy that both our soon to be 6 and 3 year old could enjoy for years to come. Of the many great features, it has this awesome feature, while working that is, to turn one of the disks which raises up the space shuttle and automatically fires the projectiles from its two launchers. Unfortunately, within 3-4 months, this feature broke somehow and it no longer raises the shuttle. My two kids enjoy this toy, but if it can't last 4 months without breaking, its not worth buying in my opinion. My boys are typical boys and no more rough on toys than anyone their age. Its not like they were pushing it down the stairs and broke, I believe it just broke while turning the disk. Disappointed for sure.